The red viewer below was made in the GDR (East-Germany) by Kamenzer Speilwerken near Dresden, from around the late 80's to the early 90's. It is one of several different models. They were made in a large variety of colours The lens side of the viewer looks very similar to a Meoskop 5 and it also bears a vague resemblance to the Gaf Model K 'Space' viewer and provides a very similar 5.5x viewing capability. The viewer bears no obvious makers name or identifying details. Because the GDR often suffered from shortages, when a new production run of viewers was manufactured they used whatever plastic they had available at the time. This has resulted in these viewers being available in a very wide range of colours. Looking even more like the GAF Model K this Stereobox viewer had the name 'REAL STEREO VIEWER' moulded into the plastic. The only significant difference to the Model K is that the light diffuser is squarer. The plastic is a matt finish, against the gloss finish of the GAF. 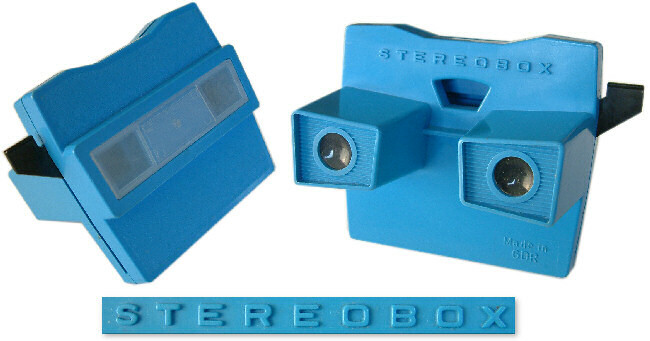 This Stereobox viewer is based on the View-Master Model E. The viewer shown below was made in the former GDR in the 1980's for sale in Saudi-Arabia. 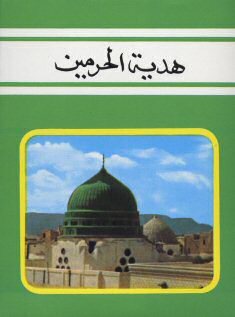 The reels supplied with it were pictures of the Saudi town of Medina and the box was in Arabic. The GDR reels and viewers are not of particularly good quality and are noticeably inferior to Sayers and Gaf products. 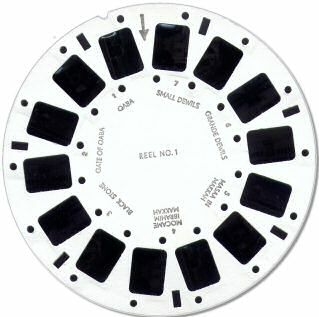 The reels are manufactured in a different manner to View-Master reels, being made from two sheets of heavy gauge paper with the slides pressed between them. The are prone to warping and feel as if they would easily sustain damage. A more shocking example of colour used in the manufacture of Stereobox viewers, fluorescent green! An older variant of the type of Stereobox viewer shown above. This viewer has a screw-together case and bears no identifying marks, which is quite common for East German Stereobox viewers.